This dramatic image by Robert Taylor shows the danger of this vital mission. The bombing of the Ploesti Oil Fields was one of the most famous missions of World War II. This is a hard to find print by Robert. This print was issued to commemorate the 50th Anniversary of the infamous Ploesti Raid of August 1, 1943. 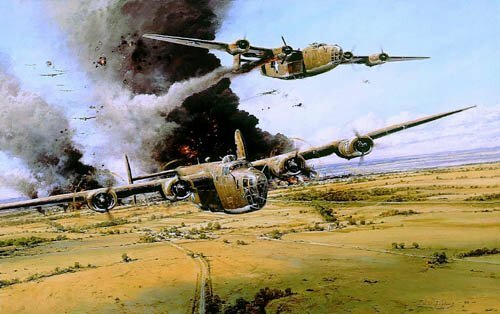 This hazardous and costly raid on the Rumanian oil fields, which supplied one-third of the Reich’s fuel, was conducted by Consolidated B-24 Liberator bombers. Of the 178 B-24s dispatched, 52 were lost and all but 35 aircraft suffered damage, one limping home after 14 hours and holed in 365 places. Ploesti witnessed countless acts of heroism, for which the crews received more decorations for bravery than any other mission of the war.